Ben Cruachan is a long rocky ridge running mainly E-W but with many minor ridges on both the Glen Noe side and the Loch Awe side. The slopes of the main ridge are generally steep and craggy. 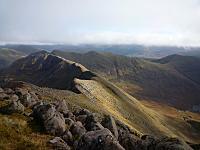 On the main ridge there are two peaks ranked as Munros, Ben Cruachan and Stob Diamh. N.B. 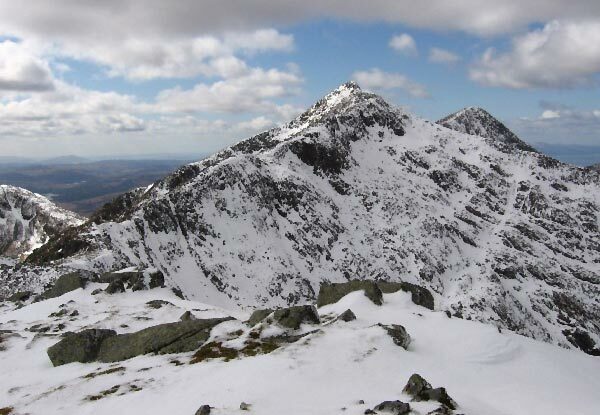 "Ben Cruachan" refers to both the mountain and the highest top. The most common ascent route involves a circuit of Coire Cruachan with its water reservoir. Routes ascend Meall Cuanail, due S of Ben Cruachan or from the reservoir to the bealach between Ben Cruachan an Meall Cuanail. Looking from Ben Cruachan onto the ridge towards Stob Diamh. Ben Cruachan taken from the A828 near Connel Bridge. Looking west to Ben Cruachan (and Mull beyond) from near the summit of Stob Daimh - Late May 2006. View from Drochaid Ghlas. Ben Cruachan at the front left with the majestic Taynuilt Peak behind. 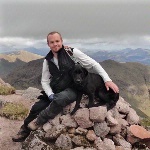 The summary information of one or more ascent routes that include Ben Cruachan. 1 1904 m 19.99 km 7.5 hrs Ben Cruachan and Stob Diamh Moderate climb on mixed terrain. 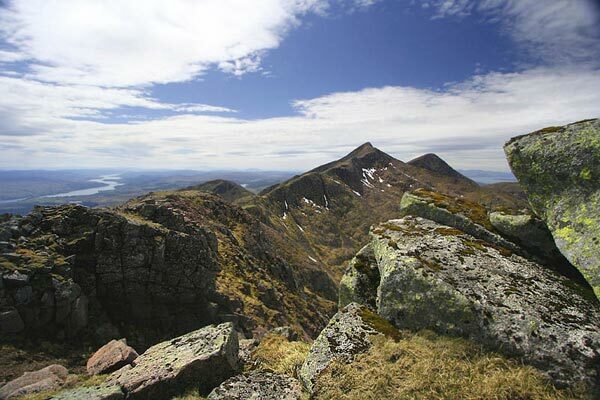 Ben Cruachan is an excellent mountain with a craggy summit, but no scrambling is required. 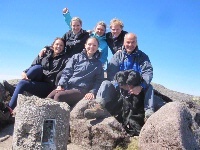 Post a few words about Ben Cruachan or read what others have had to say. Started East of Loch Awe on the B8077 where this a large ugly scar well up Alt Coire Ghlais.Not sure what the work is but it is not pretty.Headed directly for the buttress between Stob Garbh and Stob Diamh for a nice and steep scramble then on to the summit for truly outstanding views as far as Arran and Ben Nevis.West and down to the Munro top Drochaid Ghlass and then the steep pull up Ben Cruachan.Not before stopping to admire the large Coire on Cruachan.There is an Arete style scramble up the the pointy summit.We continued the day from here and took in the Corbett Beinn a Bhuiridh from Cruachan reservoir. If starting from tunnel under Falls of Cruachan station don't miss the small footpath sharp left through bracken before you reach the top of the steps behind the station (next to start of pylon). This is a full day's walk needing plenty of stamina especially for the scramble at the top of Ben Cruachan (and for getting down again!). Choose a day with clear blue skies to take best advantage of spectacular views, but take care looking up as the mud, scree and rocks underfoot demand close attention! The walk up to the reservoir is also rewarding for those who don't want to go all the way. Take in all the 3000+ summits and Corbett in the one go, this makes for a good enjoyable walk! I'm not sure where I read it (may have been McNeish's "The Monros") but "the traverse of the Cruachan ridge is the best walk in the Southern Highlands". I couldn't agree more! On a clear, if a little hazy, day, this was a fantastic walk where it is possible to take in 10 peaks (2 Monros, 1 Corbett + 7 just as attractive), if you didn't mind extending yourself to descending and re-ascending some of the smaller off shoot ridges, and a Corbett,with fantastic views all round, and nowhere near as hard or as exposed as it looks. 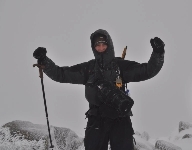 Climbed Cruachan and Stob Daimh jan 06. Practically no snow on the tops. Strange! Started from tunnel under Falls of Cruachan station. There was a sign from the police warning of potential car crime. My car was intact when I returned seven hours later. Took the hills in a clock-wise route, ascending between Meall Cuanail and Ben Cruachan. Took in Ben Cruachan, Drochai Ghlas, Stob Daimh and Stob Garbh.Fantastic route, the ridge is narrow in places requiring concentration. Great fun though! Descended between Stob Garbh and Beinn a' Bhuiridh. Straightforward from here back to car.